Luola (the Finnish word for cave), is a micro design temple in Nueva Córdoba, the city’s vibrant hub. 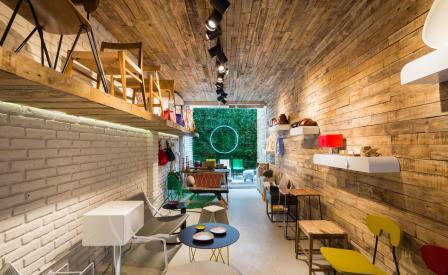 Spanning just 22 sq m, the store, designed by owners architect Javier Feijoo and graphic designer Nicolás Contreras, makes the most of its compact space with a minimal material palette; the ceiling and one wall is clad in rough-hewn wood pallets, adding a sense of fluidity, while in contrast, the remaining white-painted brick wall compliments the concrete floor. The shop’s wares are a conversation between the old and the new, with designer César Janello’s ’Classic W’ chair (from 1947) sitting alongside contemporary iron and wood tables by Federico Churba. ‘Luola emerges as a space dedicated to the exhibition and sale of Argentina´s best designs. We have carefully selected the most talented, serious and cutting edge names in our country,’ enthuse Feijoo and Contreras, also proprietors of Kosovo Gallery, a contemporary and street art gallery in the same city.